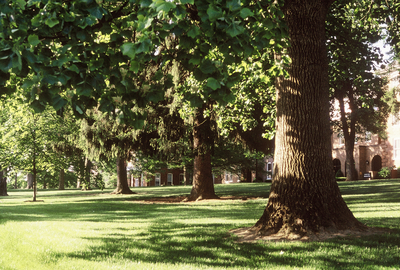 "Tulip poplar in front of Flory Hall" by L. Michael Hill PH.D. The large-trunked tree in the foreground is the tulip poplar, Liriodendron tulipfera (Magnoliaceae). The buildings in the background are Memorial Hall to the left and then to the right, the Flory Hall complex, late 1990’s.